In the summer of 1832, a young Abe Lincoln ambled into a small frontier village in New Salem, Illinois. A few months later, the six foot, four-inch Lincoln was challenged to a wrestling match by Jack Armstrong, the town toughie. 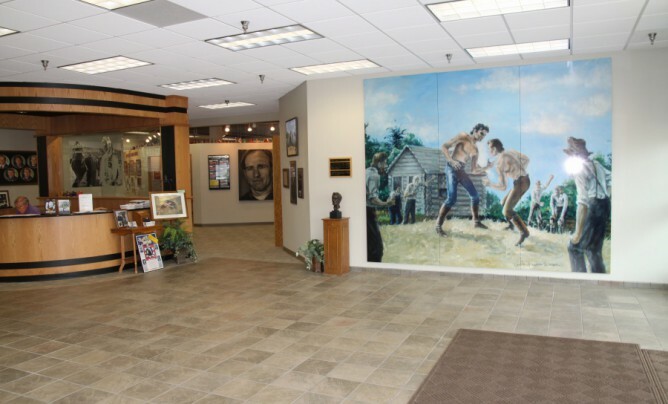 A life-size mural of the match greets visitors in the Lincoln Lobby. It was commissioned by the DGIWIM and painted by Jack Bender, a well-known national sports artist and Alley Oop cartoonist, and his wife, Carole.